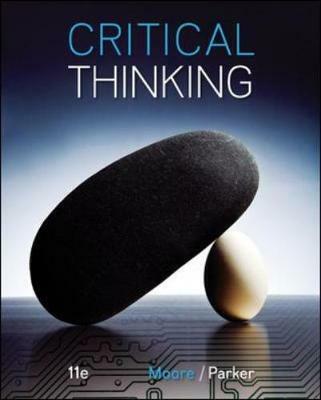 The first integrated program designed specifically for the critical thinking course, Moore & Parker's Critical Thinking teaches students the skills they need in order to think for themselves-skills they will call upon in this course, in other college courses, and in the world that awaits. The authors' practical and accessible approach illustrates core concepts with concrete real-world examples, extensive practice exercises, and a thoughtful set of pedagogical features. Connect and LearnSmart for Critical Thinking coalesce in a highly adaptive learning environment where each student gets the targeted help he or she needs for more efficient mastery of course concepts. * SmartBook ® - an adaptive digital version of the course textbook that personalizes your reading experience based on how well you are learning the content. * Access to your instructor's homework assignments, quizzes, syllabus, notes, reminders, and other important files for the course. * Progress dashboards that quickly show how you are performing on your assignments and tips for improvement. * The option to purchase (for a small fee) a print version of the book. This binder-ready, loose-leaf version includes free shipping.